SME and the MEC worked with the Boy Scouts of America (BSA) to develop the Mining in Society merit badge, including the requirements, pamphlet, badge design and other materials. In our ongoing efforts to help Scouts learn about the mining industry and its impact on their lives, we’re pleased to provide this resource page for those earning the badge, their merit badge counselors and others. Have questions? Contact us at mec@smenet.org. MEC and SME staff and volunteers will host a booth at the 24th World Scout Jamboree at the Summit Bechtel Family National Scout Reserve BSA facilities in West Virginia, July 22-August 2, 2019. Plans are to educate Scouts from around the world about the importance of mining and minerals in their daily lives. 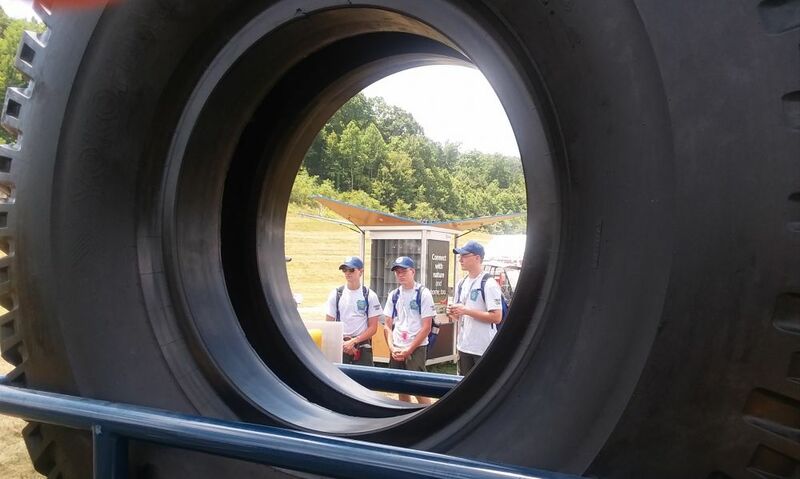 Above, Scouts check out the incredible size of the mining truck tire in a display provided by King Tire Service and Coronado Coal’s Toney Fork mine in Lorado, West Virginia. Roll call! Sign up for more information and resources. Find a mining exhibit near you. Download the MiS merit badge workbook. Print posters to promote the Mining in Society merit badge. Plan merit badge workshops involving a mine visit or using other options, including a virtual tour. Find answers about the MiS merit badge in the Frequently Asked Questions document. View a recording of the Mining in Society merit badge counselor webinar. Learn more about Boy Scouts of America merit badges. Read the Mining in Society merit badge requirements. View the Mining in Society merit badge introduction video. Review the BSA merit badge counselor resources. Purchase the Mining in Society merit badge pamphlet. Complete an adult application to become a Mining in Society Merit Badge counselor with Boy Scouts of America. Create an online account with BSA, then complete the BSA Youth Protection Training (YPT). From the My.Scouting.org portal, click on E-Learning. Print completed certificate. Contact your local Boy Scouts of America council. Submit your completed adult application, merit badge counselor information form and YPT certificate. Join the Roll Call! Let us know you’re out there and sign up for more information and resources. FYI: The Mining in Society merit badge patch number is 619674. Support the experience of the Mining in Society merit badge for Scouts worldwide. Scouts, Scouters, parents, SME members, sections or student chapters: Send us your MiS success stories! Did you or your Scouts(s) learn or do something exceptional while earning the badge? Did you host a special MiS event? Want to recognize someone who provided outstanding assistance, or just share your thoughts on your experience? Please drop us a note at mec@smenet.org – pictures are always welcome, too!